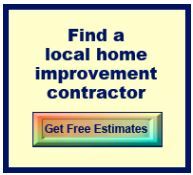 Our screen porch ideas are a joint effort between The Porch Company of Nashville TN, nationally recognized builders of exquisite porches and enclosures, and the two of us. 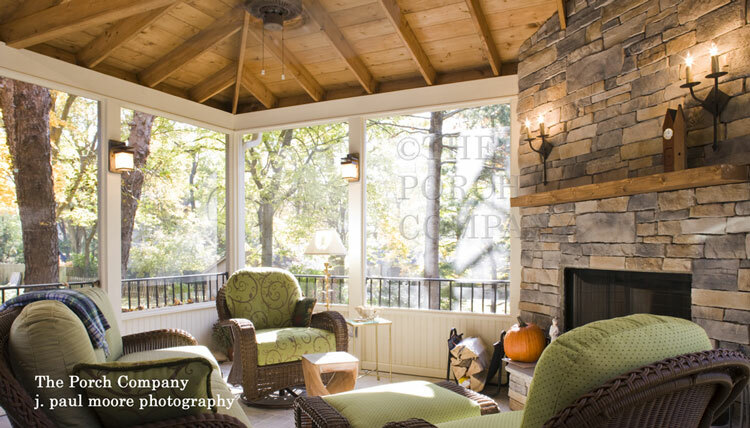 Whether you have a small screen porch (like we once had) or a custom screen porch addition, our pictures and design tips will give you ideas for creating something special. 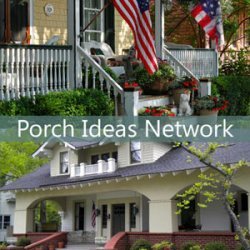 So sit back and take a look at these beautifully designed and furnished porches and start your own list of screen porch ideas. So please look at these photos in detail. 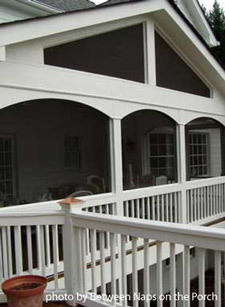 We'll point out certain features and characteristics for you to consider for using on your own porch. 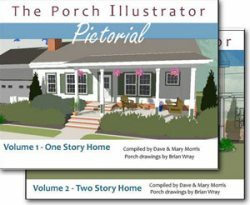 (Because the photos on our site are copyrighted and as a courtesy to The Porch Company, you may not use them without permission). By bringing the indoors to your porch, you can create a comfortable outdoor space that transitions from your home to the outside. Our interior designer friend, Bohnne, says the trend is to "bring the indoors out and the outdoors in". How Do You Transition from Your Home's Interior to the Outside? Screen porch idea: Bring the indoors out. The chimney mantel and sconce planter on the fireplace chase, along with the hutch and plants make for a very seamless transition from the home's interior to this wonderful screen porch. You can create this transition no matter the size of your screened porch. Keep in mind; however, that certain pieces of furniture, like the soft yellow hutch for example, need to be protected from the weather. 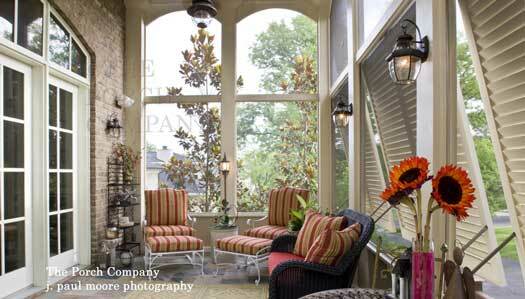 Transition with furniture: You can also create a transition with furniture pieces on your porch. For example, this arrangement could be found in any living room and is perfect for conversation or relaxing in front of the fire. Note the outdoor lamp, credenza, and a whimsical piece of art on the hearth. Simple and refined - it works very nicely. Shutters: This may be a less subtle approach but the hurricane shutters provide a visual barrier, especially when the doors to the enclosure are open, making the outdoor room appear more as part of the home's interior. 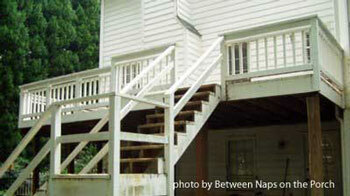 They can help to keep the porch cleaner and protected from weather. You can adjust the shutters to give a clearer view of the yard when you want. 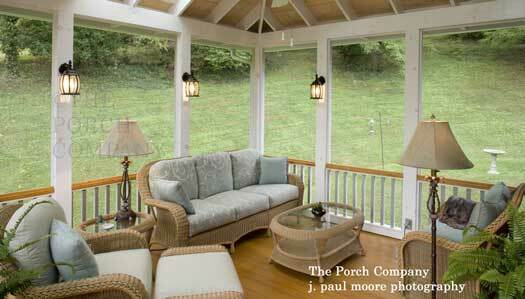 Another screen porch idea: Notice how the sofa and chairs are facing toward the home's interior. From the inside looking out onto the porch, the furniture is a truly welcome invitation. The dining set allows the family and guests to enjoy the outside view while dining. 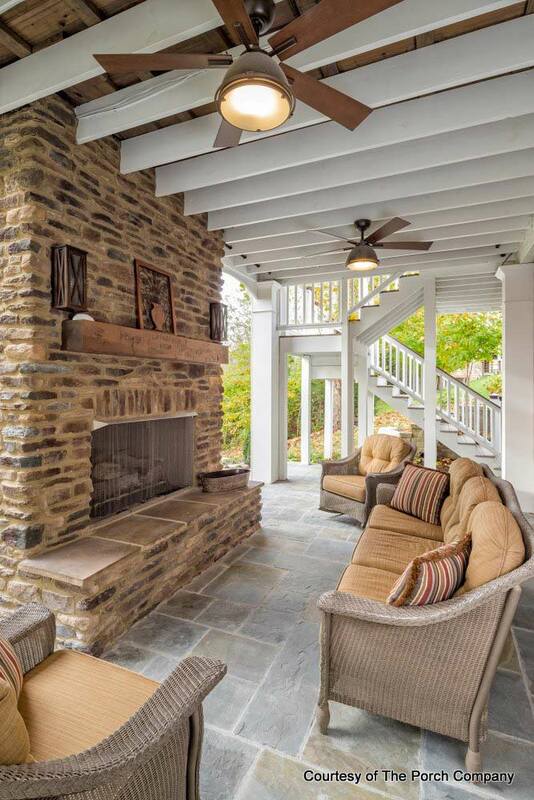 What Amenities Will You Want on Your Porch? More than the basics: Notice the flat screen TV, stone chase and hearth, custom railings, and exposed rafters in the ceiling. Excellent screen porch ideas to consider for your room. It's wise to know what amenities you want on your porch (like the flat screen over the fire place) so that adequate electrical requirements can be included in the design. 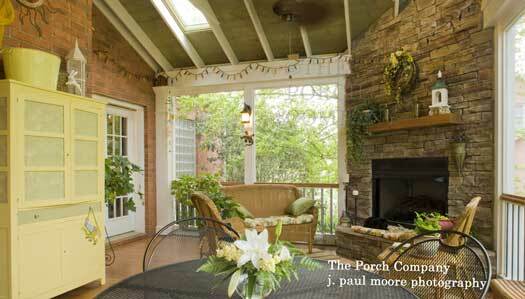 Learn more about how you will use your porch affects design and construction. You don't want an uh-oh moment AFTER your porch is completed. If you can, plan for the amenities you want in advance so that your preferences are taken into account during construction. Why? You don't want to feel disappointed when your porch is done - and virtually kick yourself for not planning in advance. Haven't we all done this at least once? Mary and I included. So, for example, do you want central speakers on your porch? Or wifi? A wet bar, perhaps? Exercise equipment? Floor receptacles for lamps? Chandeliers, fans? Storage? Artwork? A fireplace? Sconce lighting? 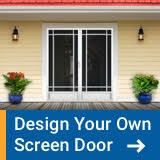 Then make your life easier by planning for them in the design of your porch. 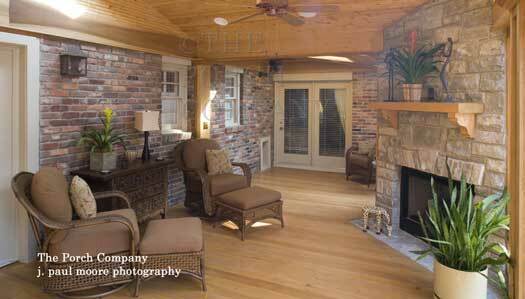 Attractive lighting: Lighting to creates ambiance and a feeling of home and warmth on your screen porch. The sconce lights and outdoor floor lamp add elegance. Can you imagine how charming and inviting this porch is in the evening with the lights lit? 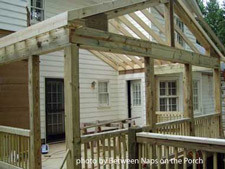 Porch ceiling: We selected this picture to show you the different porch ceiling materials being used here. 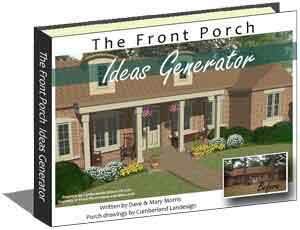 Is this a screen porch idea that you considered? In one section, tongue and groove panels were used while in the adjacent area the rafters were left exposed. Also note the can lights and sky lights in the ceiling. The screen panel frames are slightly rounded to give a softer look. Include creature comforts: Use comfy cushions and bunches of pillows to add pops of color and all-out comfort for your family. 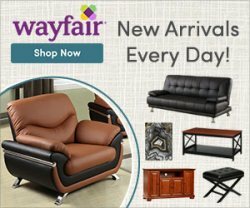 Create a pleasant seating arrangement by choosing comfortable furniture and cushions to match your personality. Don't forget the small things that count: blanket throws for chilly evenings, a drawer stuffed with napkins and coasters, board games and an Ottoman or foot stool. Screen porch ideas can come easy indeed. Our favorite screen porch idea: We really like outdoor area rugs. Do you? They sure can warm up a porch in no time. Just throw a pretty rug down and your room will change dramatically. We'd also have you note the tall plant in the corner. Often we can forget about adding height to a room. Include taller items, like this plant or perhaps a hutch or a tall plant stand, to give your room an interesting feel. - just as you would indoors. Just like any room in your home, adding tasteful artwork that shows off you personality and using taller lamps is aesthetically pleasing. 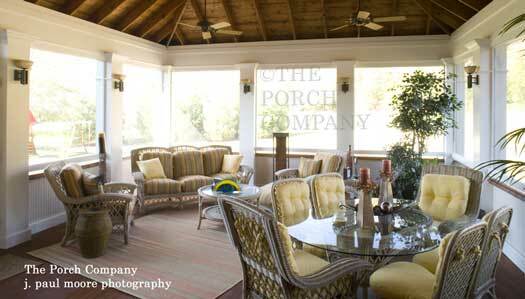 With our sincere thanks to The Porch Company for these lovely photos of their custom-designed porches. 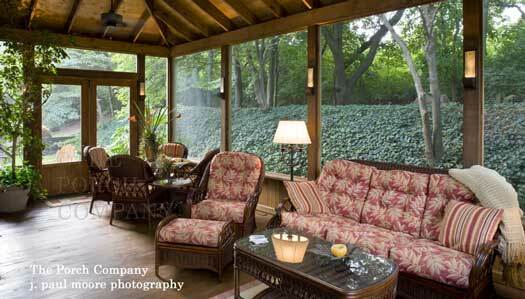 Many of us start out by converting our existing deck or patio into a screened porch. It just makes sense and it does save on overall costs. Before you do, make sure that space will be large enough or designed appropriately. A few chairs and a grill on a deck or patio may be sufficient, but a screen porch gives you more options for other entertaining ideas. 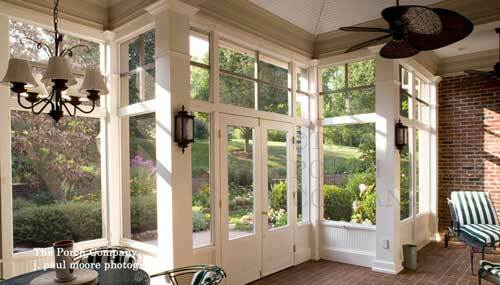 A long more narrow screened porch rather than a square one will allow more light into the home and if it is at least 8 feet wide allow for dining and extra seating on the sides. Make sure it is open on three sides for added ventilation, light, and an added sense of being outside. Ensure it is spacious enough for entertaining, relaxing, and dining. A 12' x 15' or 14' by 17' is a nice size that you wont' outgrow. Exposure is important. A southern exposure is likely to get way too hot if you live in the south or southwest but it is ideal if you live in the north. If you don't have a choice, include porch shades or blinds in your design. Screening. Plan for as much screen as possible. Previously, if you also wanted windows to extend your time outdoors in the fall, you needed smaller screen panels. Not so today. 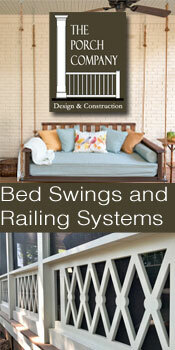 Screen porch windows can be made to fit almost any size opening. Fireplace. 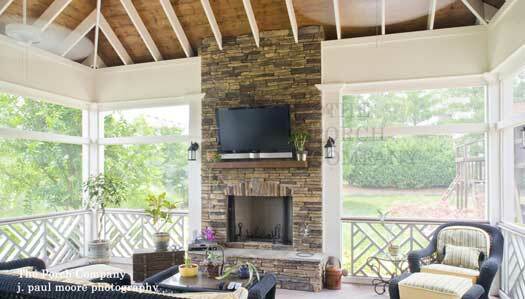 A fireplace ensures your screen room is comfortable on cool spring or fall evenings. 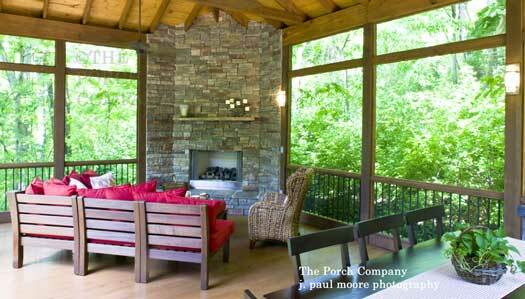 Screen porches can usually accommodate either a wood or gas fireplace. 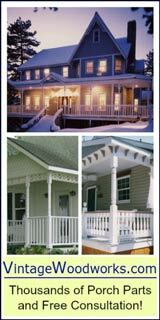 Here's an informative article to help you decide what type is best for you and your porch. Flooring Materials. You have options. An existing concrete patio floor is probably the least expensive and you can either have it stained or stamped - makes a beautiful floor that your neighbors will envy! Wood floors are most common. You can choose from treated wood, cedar, pine, or even composites. Composite flooring is almost maintenance free. Ceilings. 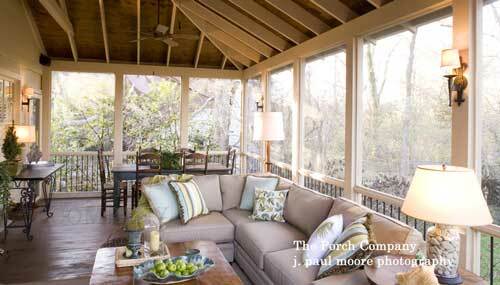 A vaulted ceiling is the way for screened in porches. They create a sense of spaciousness by design and make your porch a lot more comfortable, especially in the hot summer months. Add a few outdoor ceiling fans and enjoy. See hand hewn wood mantel shelf? Hand hewn mantel shelves (like the one above) are custom made meaning no two are alike. A wood mantel shelf adds a degree of warmth to your porch. And the one shown above is special because it's hollow. See what we mean. Speaking of screen porch ideas, we want to give you a peek at how our friend Susan furnished and decorated her new screened porch. 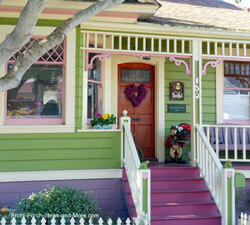 It has a romantic cottage quality to it and looks abundantly welcoming and comfortable. Sit back and relax while you enjoy the wonderful photos and story that Susan is sharing with us. 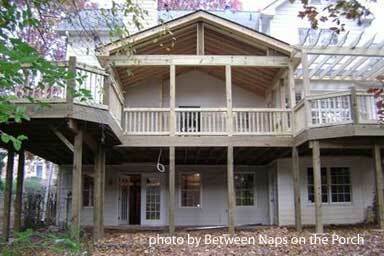 Susan moved into her home 18 years ago and knew that her existing deck needed to be redone. 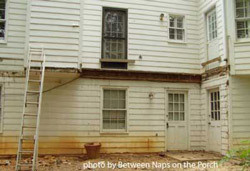 As you can see from the "before" picture below, previous owners had neglected the deck over the years and thus Susan inherited a well-worn deck with sagging and popping boards and a stair case that jutted into the center of her backyard, not architecturally pleasing. Cleaning didn't work, staining didn't work. Time for a renovation. Susan was very happy to see the old deck removed. Note the discolored siding from years of dirt being splashed on it when it rained. As a cautionary note, whenever you remove a deck ensure that existing exterior doors are nailed shut (like Susan did) so no one will accidentally open them and take that first "giant" step. We are creatures of habit and as the saying goes: "It's not the fall that hurts you, it's the sudden stop at the end". Susan took advantage of her construction project and made several other design changes that make a huge difference as seen in the photo below. Note how she turned the door below the small window into another window and then added French doors to the left of it. This added a lot more light into her lower level (which she also renovated)! Note how the deck on the left makes an excellent place for the grill and patio furniture. 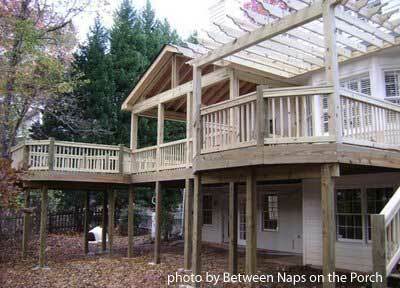 The deck extension on the right is ideal for a great seating and conversation area. The pergola fits well architecturally and provides additional shade. 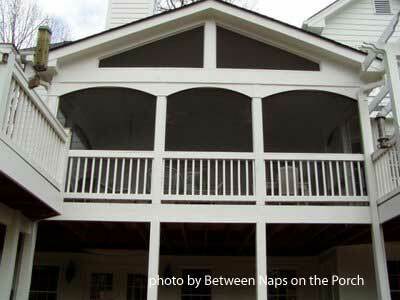 Note how the framing in the photos below allow for additional "transom" like screening at the top of the porch. This detail allows hot air to escape easily during the summer months and helps to keep not only the interior of the porch cooler but the home as well.